Early pick and roll is one of the hardest things to guard. They want to be aggressive, get the defence on their heels, attack before the defence gets set. Make quick decisions, every player can take an open shot, otherwise drive and kick, players must be unselfish, make the extra pass. The golden rule for Phoenix is don't hold the ball, don't be a holder. They like to use a 16-second shot clock in practice. The closest player takes the ball out on a made basket (it could be the point guard). The wings are interchangeable and sprint wide to the deep corners. 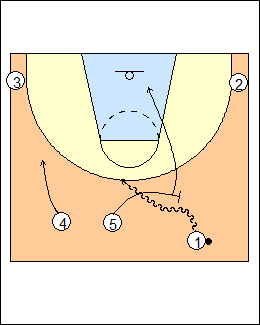 The first big will rim run, deep seal, if he doesn't get the ball in 1-one thousand, 2-one thousand he clears to the short corner opposite the ball. Options in order are throw-ahead to a wing, dribble advance to the sealing big (from the point or wing), drag screen from the second big. The screener sprints into a screen pro-lane extended, forces the on-ball defender over the screen, then opens up to the ball, maintaining vision. See Fast breaks - Triano early offence, Defence - Dave Severns ballscreens. If X4 is able to hard hedge, trailer 4 slips (rolls), first big 5 lifts (replaces), 2 lifts out of the corner (back action). 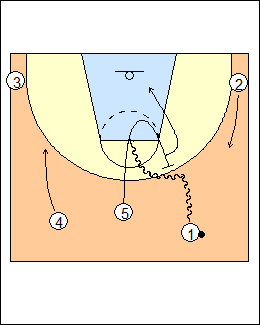 See Fast breaks - Serbia U20 (pick and roll by the trailer). The trailer is a shooter, 5 ducks in from weakside. See Offence - Tennessee playbook (late clock #3), Quick hitters - Ravens 2015. 5 picks and rolls in transition, 4 spaces if he is a shooter. If 4 is a non-shooter, he can set a wide pin-down for 3 (quick action, see below). 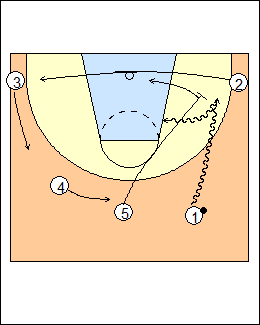 See Fast breaks - Suns 5-out (fake the screen), Larry Brown (quick, double), Nets (both bigs trail the play), Quick hitters - Trail. 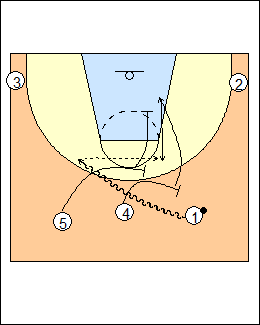 A call after a made basket or free throw, 5 rolls, 4 pops, and can be the first screener. See Fast breaks - 5star pro-style (double drag), Offence - Mike D'Antoni (double drag), also Offence - Xavier middle ballscreens, Tactics - Ben Braun ballscreens. 4 screens first, rolls down to the second hash mark, 5 screens for 4 to come back out. 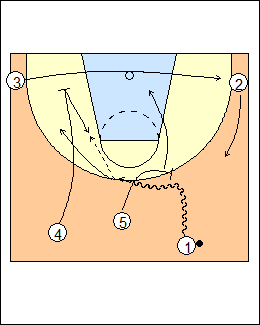 1 makes a dribble hand-off with 2, 5 follows to pick and roll, 4 stays spaced. 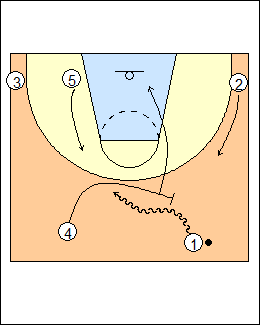 See Fast breaks - Early ballscreens (Ravens pistol down). If 2 is denied on the dribble hand-off, 5 sets a deep pick and roll for 1. 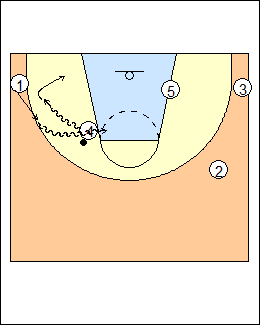 See Fast breaks - Triano early offence (Two-up). 5 thinks he can beat X5 up the floor, X5 gets back in front, 5 peels back, sprinting into a step-up (flat) screen, 1 can go either way. Quick action is a wide pin-down. 4 sets a wide pin-down for 3, 5 picks and rolls, 2 lifts (back action). 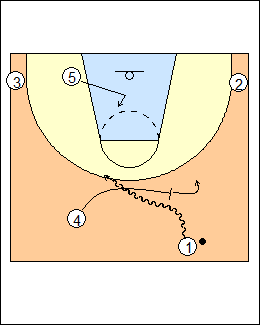 3 can curl the pin-down and catch and shoot, or pass to 4 for a short jump shot. 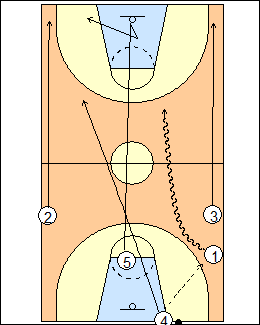 3 back-cuts if top-locked (X3 does not let him use the screen), 4 cuts back to the pinch post for a pass from 1, who cuts off 4 (a two-man game). 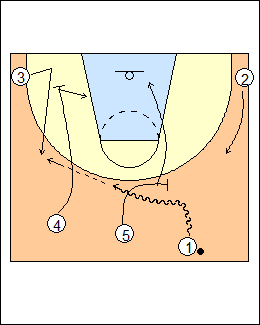 If the pinch-post pass is denied, 4 sets a step-up ballscreen for 1. If 4 does not want to attack he can dribble hand-off with 1, or pass and follow to ballscreen. If defenders switch the pin-down, 3 straight cuts for a pass, and 4 posts after screening. See Fast breaks - Spurs 2007, Duke down series, Memphis (go), North Carolina (B-3 and counter), Triano early offence (single), Quick hitters - Duke actions (down).